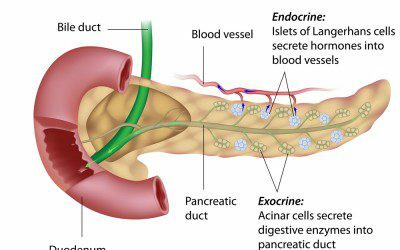 The cells located within the islets of Langerhans of the pancreas that secrete insulin. The process leading to Type 1 (insulin-dependent) diabetes appears to start when the immune system recognizes and attacks proteins on the surface of the beta cells, possibly mistaking them for proteins on an invading organism. From here, the process leading to Type 1 diabetes is a complex and poorly understood chain of events. White blood cells called cytotoxic or “killer” T cells flood into the pancreatic islets and cause an inflammation known as insulitis. Over the course of years, the beta cells are gradually destroyed. Once most of them are gone, the symptoms of diabetes begin to appear. By discovering more about this immune system attack on the beta cells, researchers hope to devise ways of interrupting the process and preventing or delaying the onset of diabetes.